Aila, Laila and Kaila: What’s in a Name? Kalidasa – Poet or Scientist? I am Chinmay Kulkarni.I am doing my M.Tech. in Pune University .I read your every article.It is so informative for student of Meteorology like me.Thank you very much for these informative blogs…. Actually,I was expecting a blog on “Extreme Polar Vortex that happened in North America” are you going to write??? No, I do not propose to write about the polar vortex. Mainly because I live in India and I do not know much about happenings in the U.S. I have never been a great believer of global warming anyway! Read your article. I want to know that at our native place no rainfall since last 2 years. 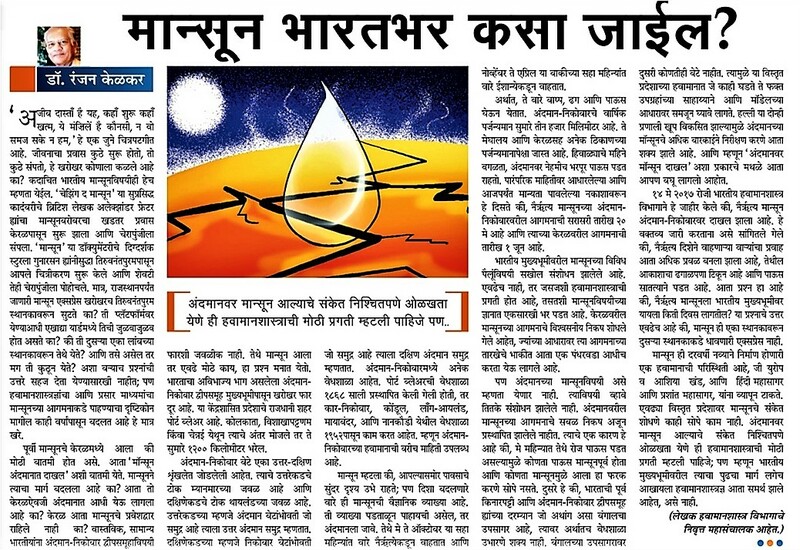 facing Drinking water scarcity. How will we survive? We want to know the process of artificial rainfall. Simple way. I appreciate your difficulties. You have not told me which is your native place. Have you not received any rain this year also? Artificial rain making is a serious matter. It should be done only by the government or scientists. Individuals should not attempt it. But there is something that individuals can do. They can pray to God for rain, if they believe in him. Please click on “Artificial Rain” in the list of articles to read it. I am glad that you have liked my blog and found it useful.